World Reacts With Skepticism To Saudi Account Of Jamal Khashoggi's Death Saudi officials initially claimed that the journalist, who had been missing since Oct. 2, left their consulate in Istanbul alive. Jamal Khashoggi poses at an event in Istanbul in May. Saudi state media confirmed the journalist's death, but details remain fuzzy. American lawmakers and European leaders have reacted with skepticism following the Saudi government's confirmation of journalist Jamal Khashoggi's death. According to the Saudi statement, "discussions that took place between him and the persons who met him during his attendance in the Kingdom's consulate in Istanbul led to a quarrel and a brawl with the citizen/Jamal Khashoggi, resulted in his death." Eighteen Saudi nationals have been arrested as the investigation continues. The Saudi statement, issued early Saturday from Riyadh, offers the official Saudi account of what happened inside the Saudi consulate on Oct. 2. It comes despite the claims of Turkish officials who have said they have evidence of his killing, including an audio recording of Khashoggi's death. "Turkey will uncover whatever happened. No one should have doubts about that," Omer Celik, a spokesperson for Turkey's ruling party, said on Saturday. That's according to Turkey's state news agency, Anadolu. The Saudi government's version of Khashoggi's death has shifted since his disappearance. 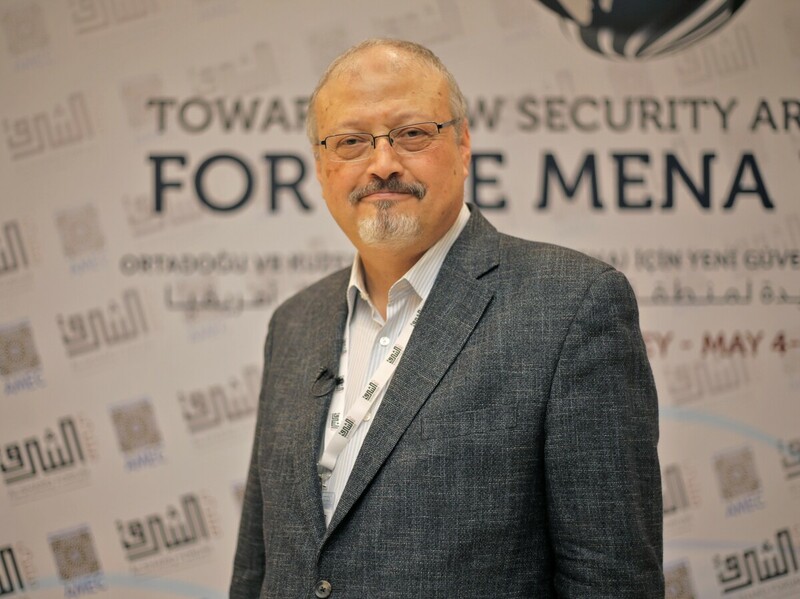 Saudi state media initially claimed that Khashoggi left the Saudi consulate alive, while Turkish officials claimed early on that Khashoggi had been killed. In an interview with Fox News on Sunday afternoon, Saudi Arabia's foreign minister Adel al-Jubeir called the murder "a rogue operation" and said, "We are determined to pursue this [investigation] to the end in order to uncover the truth and make sure that everybody knows what happened." Saudi state media released statements on Saturday claiming that Bahrain and the United Arab Emirates fully supported the investigation. The Egyptian Ministry of Foreign Affairs said in a statement that the investigation "demonstrates the Kingdom's keenness and commitment to finding the truth of this incident." According to the official news agency WAM, the UAE on Saturday backed Saudi Arabia's statement about the death of Khashoggi. "Since its establishment, Saudi Arabia has always been fair and does not hesitate to apply its provisions," WAM said in Arabic. The secretary-general of the Organization of Islamic Cooperation Yousef bin Ahmad Al-Othaimeen "praised the transparency of the Saudi government's handling" of Khashoggi's disappearance. "The Saudi judiciary, which has integrity and independence, will issue fair judgments and it is not appropriate to prejudge judicial rulings," he said. At a defense event on Friday evening, President Trump told reporters he found the Saudi statement credible and called the arrests "a big first step," Reuters reports. On Saturday, Trump told reporters that no one in the administration has heard audio or seen video of the events in the Saudi consulate. He added that he plans on speaking with Saudi Crown Prince Mohammed bin Salman. "It's possible," Trump said, that Mohammed didn't know about Khashoggi's death. Prior to the Saudi state media's confirmation, Trump told reporters in Arizona that he would "very much have Congress involved in determining what to do" in response to Khashoggi's death. When asked if sanctions on Saudi Arabia are possible, Trump said they "could be, could be." Sen. Lindsey Graham, R-S.C., tweeted on Friday, "To say that I am skeptical of the new Saudi narrative about Mr. Khashoggi is an understatement." "As a Senate Foreign Relations Committee member, I am seeking a classified briefing and depending on the facts of this case, we may need to re-assess our relationship with the Kingdom of Saudi Arabia, including planned arms sales, our ongoing support for the war in Yemen, and other aspects of our partnership with the Kingdom." #Khashoggi was a 60 year old man. What sort of equal “fight" would he have had against 15 other men? And who brings a bone saw to a “discussion”?! The stupidity of the Saudi explanation is mind boggling…. What I hate about the statement is the use of the passive construction to imply this was an accident. Jamal didn’t just “die during a struggle.” #Khashoggi was killed. By Saudi men. In a consulate. His life was taken from him. Bloomberg News reports that German Chancellor Angela Merkel didn't accept the Saudi explanation. At a political convention in Germany on Saturday, she said the facts of the case, "still haven't been cleared up, and of course we demand that they be cleared up." In a statement with Foreign Minister Heiko Maas, Merkel called the investigation "inadequate." After talks in Copenhagen, Danish Prime Minister Lars Lokke Rasmussen said, "We haven't been told the full truth, and we must insist on getting that," Bloomberg News reports. According to Reuters, Dutch Prime Minister Mark Rutte had questions, too: "A lot still remains uncertain," he told reporters. "What happened? How did he die? Who is responsible?" French Foreign Minister Jean-Yves Le Drian said in a statement, "France condemns this murder in the strongest terms." United Nations Secretary-General António Guterres encouraged a "prompt, thorough, and transparent investigation" into Khashoggi's death.